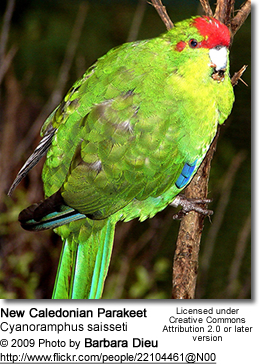 The New Caledonian Parakeet (Cyanoramphus saisseti) or New Caledonian Red-crowned Parakeet, is endemic to New Caledonia - an island located in the South Pacific Ocean, east of Australia. This species was once considered to be conspecific (of, or belonging to, the same species) with the Red-fronted Kakariki of New Zealand but is now considered a full species. It averages 6 cm or 10.25 inches in length, including tail. The wing length is about 114 - 135 mm or 4.5 - 5.25 inches. 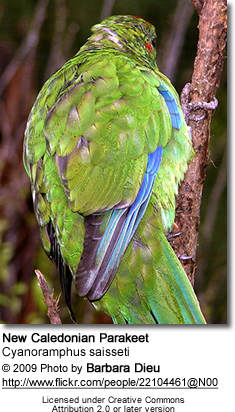 It looks similar to the Red-fronted Parakeet; except the sides of the head, breast and abdomen are much more yellow. The red crown is paler. It is smaller in size. Its natural habitats are subtropical or tropical moist lowland and moist montane forests and shrubland, as well as dry savanna. They are usually observed in pairs or small groups in treetops or on outer branches of bushes outside the breeding season. Pairs may remain alone throughout year, but these parakeets usually form small flocks. They often forage on or near the ground. They gather at springs and water holes on islands with limited water supply to drink and bathe. Occasionally flocks fly to neighboring islands to forage. They feed on leaves, buds, flowers, shoots, seeds, fruit, berries, nuts and other parts of plants. They also eat insects and animal remains. On islands and In coastal areas, they forage on seaweed and mussels. They also take up tiny stones, most likely to help with digestion. 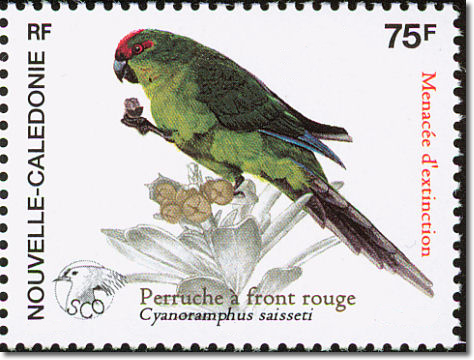 Species: Scientific: Cyanoramphus novaezelandiae saisseti ... English: New Caledonian Red-fronted Parakeet ... Dutch: Nieuwcaledonische Roodvoorhoofdkakariki ... German: Neukaledonien Ziegensittich ... French: Perruche de la Nouvelle Caledonia.